Thanks to decades of right wing anti-Cuba propaganda, some politicians on the left run for cover when asked for an opinion on the legacy of Fidel Castro, who passed away on November 25. The latest shameful example comes courtesy of interim New Democratic Party Leader Tom Mulcair, who tweeted the following: “Upon the passing of Fidel Castro let us think of the lives impacted by his actions and be hopeful for the future of the Cuban people”. Though federal New Democratic Party Leader Tom Mulcair rules out hiking taxes on corporations and the super-rich, and promotes investment in climate-wrecking fossil fuels and pipelines, the party’s campaign for a cross-country child care plan is a breath of fresh air. Stealing a march on the ruling Conservatives and the third party Liberals, the labour-based NDP Official Opposition launched its election platform, more than a year before the anticipated 2015 vote. It did so with a pledge to create one million $15-a-day child care spaces across the country within eight years. While the time frame resembles the agonizing pace recently proposed by Mulcair for raising the federal minimum wage to $15 per hour (i.e. by the year 2018), it has the merit of putting child care back at the top of the political agenda. It also represents a step away from years of retrenchment and towards the expansion of public services. 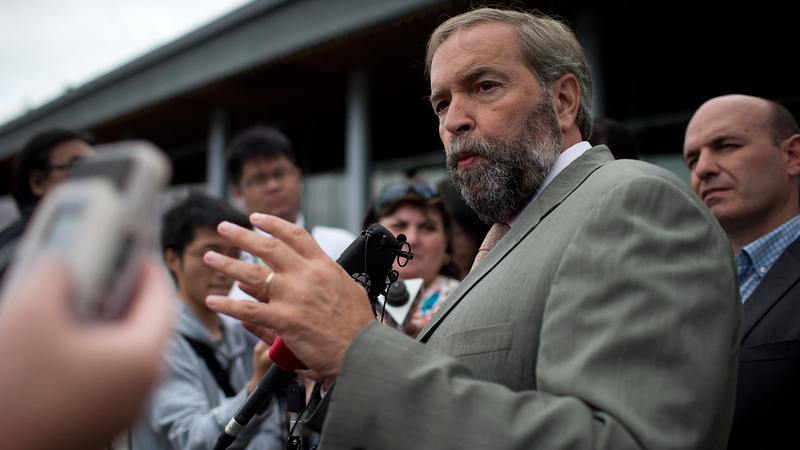 The NDP plan depends on partnership with the provinces. Ottawa would fund 370,000 child care spaces at a federal cost of $1.87 billion. The annual cost to create or maintain one million affordable spaces would rise to more than $5 billion by 2023 when the plan is fully implemented. The provinces would be responsible for 40 per cent of the program’s costs. Mulcair points out that some provinces like Ontario, which has two years of full-day kindergarten, are already spending heavily in early childhood education and care. The aim, which may miss-fire on this point, is to have most provinces signed on to the program. The prospect of success is a testament to the demands of millions of working parents who clamour for economic relief. While workers’ incomes have been frozen or shrinking for decades, the cost of living continues to rise. Toronto parents can pay up to $2000 a month for child care with average costs eating up more than 18 per cent of average Canadian family income. A $15 a day, or $300 a month plan would be a real boon. Quebec now provides $7 per day childcare. Across Canada there are licensed child-care spaces for just 22.5 per cent of children under age 5 at a time when more than 73 per cent of young mothers are working. After the Conservatives won the 2005 federal election, Prime Minister Stephen Harper scrapped a Liberal child care plan, which the Liberals spent 13 years discussing, and replaced it with a $100 monthly payout for parents with young children. 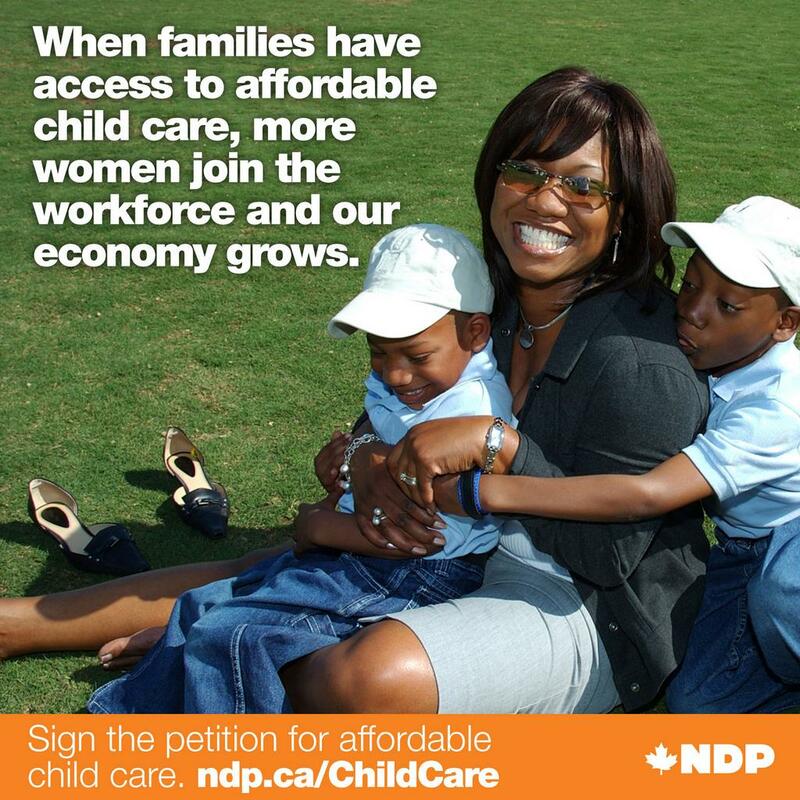 In late October, under mounting pressure from the NDP, Harper said his government will increase the benefit next Spring to $160 a month – which is still far short of the private costs most parents face. A public plan could meet the social need, and do so at a higher standard of care. The question is, assuming there is broad provincial agreement, how would Mulcair fund the federal share of the program he proposes. And how would he meet similarly urgent needs in the areas of education, health care, social housing, public transportation, and conversion to a green energy system? There is no indication that Mulcair is prepared to cut the military budget, make industrial polluters clean up their mess, and steeply tax big business and the banks – all of which would be modest but necessary steps towards a Workers’ Agenda.